Northwest Montana commercial real estate is recovering along with the rest of the Flathead real estate market. A reliable statistical analysis of northwest Montana commercial real estate sales is mostly meaningless because the types of commercial properties vary widely from low-cost warehouses to high-value medical offices. In addition, the number of sales has always been relatively small when compared to residential or land sale. For these reasons, an analysis of median or average price is meaningless. 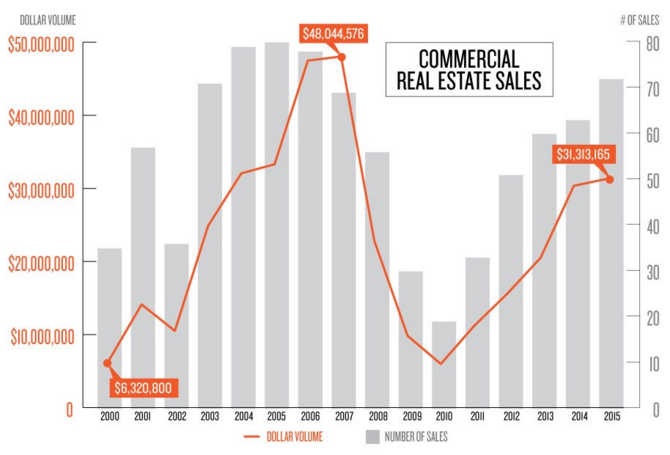 This week’s graph gives a general idea of what the market of commercial properties has been in recent years, with both the number of sales and total dollar volume reaching the high in 2006 and 2007, then dropping to a low in 2010. Starting in 2011, the number of northwest Montana commercial real estate property sales began recovering. The key factors in northwest Montana commercial real estate properties are the lease rate levels and the vacancy factor. Prior to 2007, commercial vacancy was 5 percent of less, then increased to as high as 15 percent to 20 percent in 2009 and 2010. During that time period it was common for lease rates to be dropped for existing tenants, just to keep the units leased. Over the last two years, commercial vacancies have mostly disappeared as vacancies rates have mostly stabilized at 5 percent or less. Although there are few commercial vacancies that are on the market, the monthly lease rates have not increased to any measurable degree. As we move into 2016 and if the commercial real estate market continues to strengthen, it is likely that commercial lease rates will also start to increase.